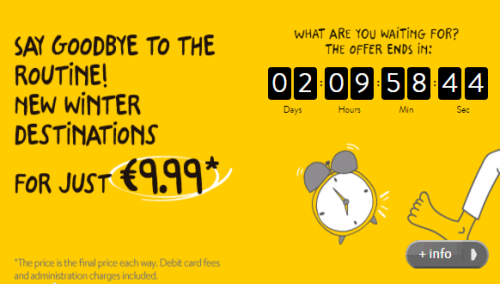 Big Vueling sale – flights across whole Europe for €9! Vueling has launched an amazing sale and you can now fly across whole Europe from all their airports for just €9.99 for one way ticket! This means return flights with Vueling can be booked for only €19.98! Travel dates for this offer are from November 2016 until 25th March 2017. The promotion is valid only until 22nd September 2016 so you have just 3 days to secure your cheap ticket. Book right now at Vueling.com to get this great deal!